Breast cancer associated with estrogen–progestin (EP) therapy may have more favorable characteristics than cancer in never users, but results are conflicting. It is not well known either whether Body Mass Index (BMI) modifies this association. 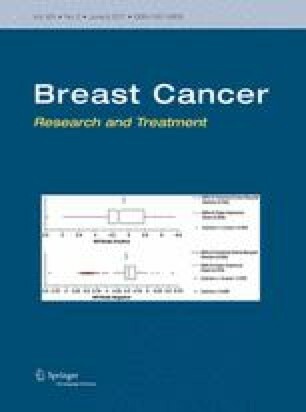 We investigated breast cancer characteristics in EP users for lean (BMI < 25 kg/m2) and overweight women (BMI ≥ 25 kg/m2). The Icelandic Cancer Detection Clinic cohort, with information on breast cancer risk factors for 90% of Icelandic women, was linked with the population-based Icelandic Cancer Registry. A total of 781 women with invasive breast cancer diagnosed 51 years or older were matched with 7761 controls from the cohort. Conditional logistic regression was used for estimating adjusted odds ratios (OR) and 95% confidence intervals (CI) according to tumor characteristics, stratified by BMI. Polytomous logistic regression was applied in a case-only analysis for testing whether the risk associated with EP use differed according to tumor characteristics. Ever EP users had a twofold higher risk of breast cancer compared with never users (OR 2.05, 95% CI 1.71–2.45). In lean women, EP use was significantly less likely to be associated with grade 2 or 3 tumors than grade 1 tumors, contrary to overweight women for whom risk was increased irrespective of grade. EP use in overweight women was associated with a higher risk of lobular than ductal cancer (OR 2.75, 95% CI 1.29–5.87). Among lean EP users, tumor characteristics were more favorable than among never users. This effect was not observed for overweight women. We are grateful to Dr. Jens Gudmundsson, Department of Obstetrics and Gynecology, University Hospital, Reykjavık, for valuable help in the preparatory phase of this study and to the women who participated in the CDC study. The project was supported by the Icelandic Cancer Society. This study was funded by the Icelandic Cancer Society. Approval was obtained for this study from the Bioethics Committee of Iceland (VSN-15-003) and the Icelandic Data Protection Authority (2014121741AT).